Ornamental Allium bulbs such as ‘globemaster’, gladiator’ and ‘giganteum’ are easy care, sun loving plants, easy to grow, alliums have low water requirements and with large flower heads (see picture right) are a colourful addition to the garden border. Alliums work well in a cottage style garden. Why not try allium gladiator, molly, siculum, murrayanum or sphaerocephalon. Allium drumstick is a popular small upright allium. 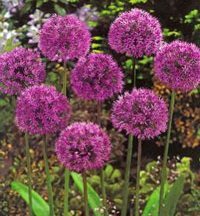 Allium bulbs for sale from our listed mail nurseries often come with cultural notes and growing tips. Alliums are related to onions and garlic, alliums are the ‘ornamental’ side of the family. 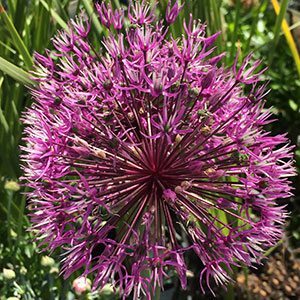 Alliums are tough, are reasonably drought tolerant and will cope with poor soil. Alliums prefer a sunny position in a well drained soil. Alliums will do well in a large deep pot or container. All Alliums like a position in full sun and a free draining soil. Allium bulbs should be planted at around 6 cm deep. In the garden plant them 8 cm apart. Alliums require little water once established. The do deep some water in spring, so in a dry spring water once every week. They require very little fertiliser. Fertilise once a year in late winter to spring with a general purpose slow release fertiliser. Alliums will need to be divided as they become crowded. Usually every 5 years. You can remove old dead foliage to tidy up in winter. A. cristophii with its large purple flower heads to 20cm (8 inches) across is a stunning plant in the border during early summer.